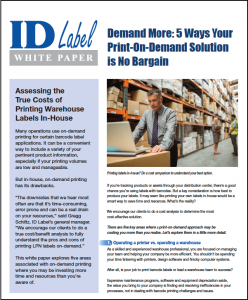 Demand More: 5 Ways Your Warehouse Print-On-Demand Solution is No Bargain | ID Label Inc. 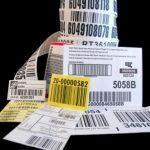 If you’re tracking products or assets through your warehouse or distribution center, there’s a good chance you’re using LPN/pallet labels with barcodes. Thousands of companies like yours do just that. It’s a simple, highly efficient way to track and manage important items. But a key consideration is how to produce your LPN labels in a way that’s cost effective and most efficient for warehouse workers. It may seem like printing your own labels in-house would be a smart way to save time and resources. After all, who hasn’t taken on a DIY project at home to try to save a little money? 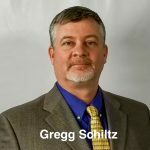 When you do the analysis for your distribution center labels, however, the results may surprise you. This is one time when DIY may be BAD. As convenient and “cheap” as it may seem, in-house, on-demand printing has its drawbacks. There are five questions you should consider to help you understand if a print-on-demand approach is costing you more than you realize. Is your time better spent operating a printer or operating a warehouse? What is the impact to your operations if there’s a label sequence error or misprint? How much are you investing in printing equipment, software licenses, supplies and manpower for “free” in-house labels? Are you satisfied with your label durability, quality and adhesive strength? Have you compared the true costs of on-demand vs. preprinted labels from an industry leader like ID Label? This informative ID Label white paper will help you assess the true costs of printing your warehouse barcode labels in-house. Download it today.